Like all other classifications of writing, horror has many sub-genres within the main genre, and even sub-genres within sub-genres. Some of these sub-genres are even associated with the authors who typically write/wrote in a certain style of horror. Splatter horror, mixed with supernatural elements, can loosely be compared to the works of Clive Barker. H.P. Lovecraft liked to deal with the supernatural and extraterrestrial, giving rise to ‘Lovecraftian’ horror. Edgar Allen Poe was known for his gothic and supernatural stories, which could be called ‘Poe-tic’ horror (yeah, I know—bad joke—you can stop booing now). As a writer of horror, I’ve tried my hand at many of these sub-genres, sometimes successfully, sometimes not. And in doing so, I’ve had my share of both positive and negative reviews. To say I’ve been called many different names would be an understatement (sick, twisted, demented, disgusting, to name a few), but that’s part of the game; you can’t please all of the people all of the time. Hell, sometimes you can’t even please any of the people any of the time! But that doesn’t mean we don’t try. And to all writers of every genre, you have my utmost admiration for not giving up. DON’T STOP! Anyway, after doing a little research for this Newsletter, I was somewhat surprised to see just how many of these sub-genres are out there. Below are what I believe to be the four main genres of horror in literature, film, television, and other forms of entertainment, with examples of their sub-genres. Maybe one of the most well-known forms of horror, this genre has murderers, real or imaginary, with crime and thrills, usually with blood, guts, and gore. One of my personal favorites, monsters and creatures date back to the early 19th century with Frankenstein, but I think they really took off in the 20th century with King Kong. Even these can be real, imaginary, or legendary. Ghosts, demons, possession, and even witches have been around forever, and fear of the unknown is a staple of horror. This genre might be the scariest of the genres since it deals with things we know are true. We’ll probably never understand how the human mind works. Please note that these main genres are just my own, and I'm sure many of you will have different ideas as to what qualifies as main genres and/or even how many there are! Click! Click! It's a sound that could drive a person crazy, but got to find its source. Traveling the corridor between life and death. A traumatized student looks to a therapist to release the demons within through hypnotism. A dog demonstrates his love for his master by bringing him gifts. This month's Question is: What is your favorite horror genre? 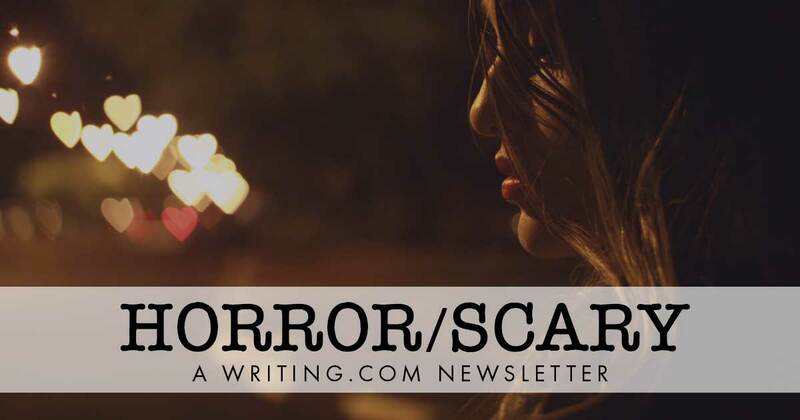 In my last Newsletter I asked what "What is the most bizarre thing you’ve ever written for a horror story?" One of the things I love about horror/scary is that in this kind of a setting just about anything can become creepy/spooky. I work at a supermarket with isn't creepy at all... until the power goes out. Then the store becomes incredibly creepy , even during the day. The most bizarre thing I've written for a horror story was about a woman changing into a claw foot tub back in college. I got an honorable mention and published in the college magazine. Sometimes the real trick to horror is to not make it horrifying. I love true crime. I love podcasts on true crime. If you want to write horror just listen to what real humans do to another human. Reality is for worse than what people dream up. Ed Kemper, Ted Bundy, I could fill this with names. You want horror ideas, just pick up a newspaper or listen to podcasts. I wrote a 10 page research on Albert Fish. You want creepy? that man was sick. Generated in 1.65 seconds at 12:10am on Apr 24, 2019 via server WWW2.